This article is part of a continuing series examining the postseason prospects of the eight seven six five four remaining MLB playoff teams in 2013. How much difference can one run make? Well, for the teams competing in their respective League Championship Series, the answer is about 9% of their World Series title chances on average. With their 1-0 victory over the Los Angeles Dodgers in Game 2 of the NLCS, the Cardinals soared into first place on the World Series probability leaderboard. Their 40% chance to win it all is a new high for the 2013 postseason. On the other hand, LA's loss sent them down to 6%—their lowest mark this October. In yesterday's other pitchers' duel, the Detroit Tigers claimed second place on the leaderboard for the first time since October 4th. The Boston Red Sox, on the other hand, dropped into third for the first time. Their 1-0 loss to Detroit cost them 13%—a whopping 3/8 of their previous World Series probability. 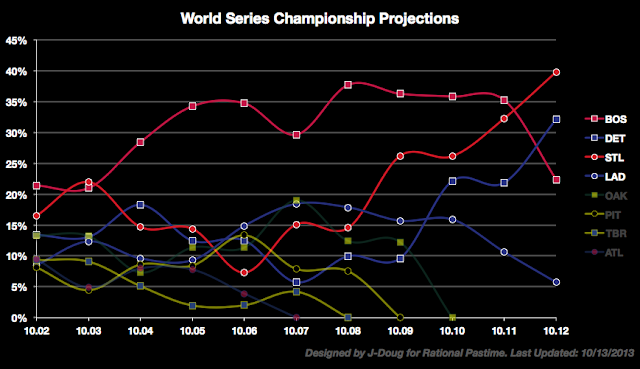 Keep reading for series breakdowns and expected World Series outcomes. 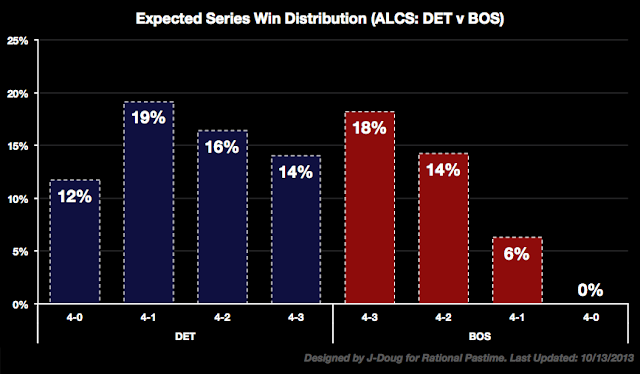 The modal outcome in the ALCS is now a Detroit win in five, followed by a Boston victory in seven. The Sox saw their chances of advancing to the World Series drop to 39%. Having lost the first two games of the NLCS, Los Angeles is in dire straits as they head back home. The two most likely outcomes are a Cardinals sweep and a St. Louis win in five. 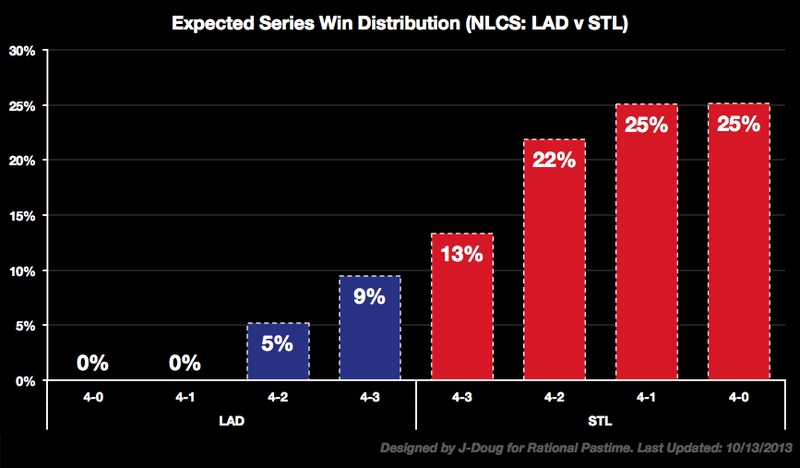 The Dodgers' best hope remains a seven game series. Detroit's upset in Game 1 shook up the list of projected World Series outcomes. 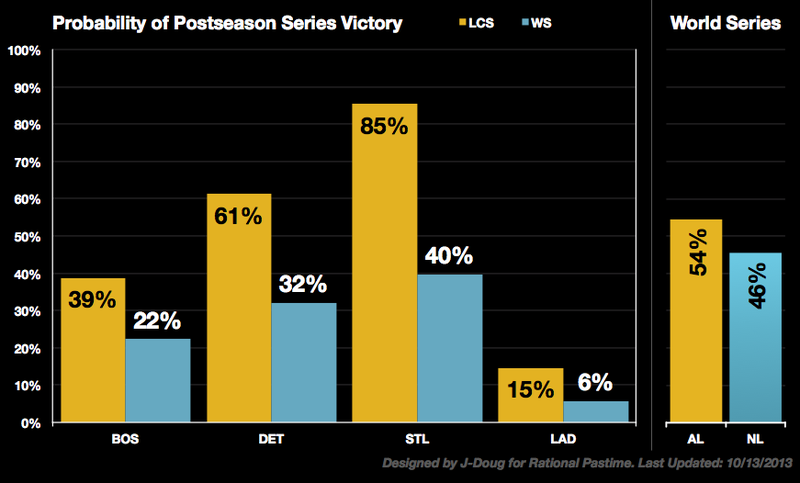 The most likely outcomes are now Detroit over St. Louis in six or seven. The previous most likely outcomes, Boston over St. Louis in six and seven, tumbled to… numbers six and seven. Check back tomorrow for updates following Game 2 of the American League Championship Series.